I finally touched up the ceiling in the bathroom- when I painted the walls I got quite a bit of green on the ceiling back in September. It was time to fix it! 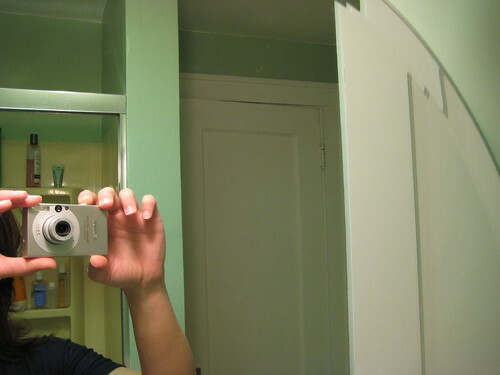 Also, you can see my shiny new camera in the new mirror. The angle of this is a bit strange (why didn't I just stand in the bathtub to take a straight on photo? 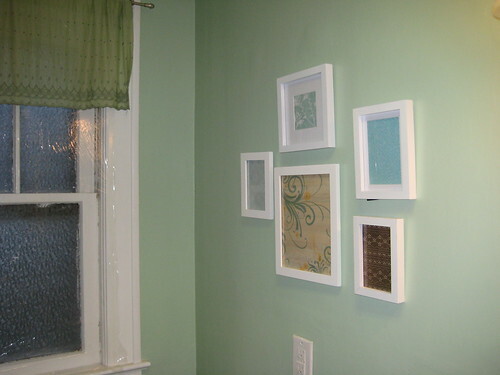 ), but I hung a grouping of white frames on the wall to cover up some poor plaster work (by me, ahem). I wanted to hang some beautiful artwork, but I don't really have any pieces, so instead I went the thrifty crafty route and used scrapbook paper! I chose several different designs from Archiver's, and then picked what looked best against the wall. I cut the pieces to fit, stuck them in some cheap frames from Target, and voila! Instant artwork! Nevermind that the sticky hooks I used to hang them up fell off the walls last night...looks like I'll have to bust out a hammer and nails after all. On a side note, green walls are really hard to photograph against.